Spruce Knob (elevation 4,863 feet) is the highest point in West Virginia as well as the entire Allegheny Mountains range. It sits atop Spruce Mountain and contains a sky island of boreal forest made up mostly of spruce. The spruce trees branches point east due to gusty winds out of the west. During my time there, I discovered the western side of the summit is much cooler than the eastern side. The summit contains meadows filled with large boulders interspersed with dense forest. Spruce Knob is on a ridge commonly referred to as Allegheny Front. 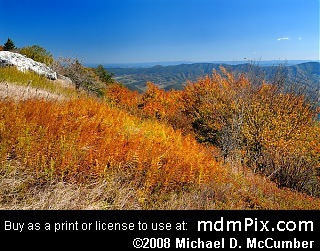 shareShare this Page "mdmPix.com: Spruce Knob"